This news is about three weeks old, but in the fog of the arrival of a new baby, I neglected to note that India's Reliance Industries agreed to a joint venture deal with Texas-based Carrizo Oil and Gas for its Marcellus Shale acreage. I had previously cited speculation in Indian newspapers that Reliance was looking at Quicksilver Resources, but that obviously didn't happen. Under the terms of the deal, Reliance will pay $392 million for 60% of the JV that will control Carrizo's 62,600 acres in central and northeast Pennsylvania. The price implies a valuation of $6,258 per acre, which is considerably less some other recent international JVs in the Marcellus Shale, including Reliance's $14,167 per acre deal for a JV with Atlas Energy and Mitsui's $11,100 per acre for a JV with Anadarko. This is the third U.S. shale gas deal in the course of a few months for Reliance. The company's international E&P company is now being headed by Walter Van de Vijver, who is the former CEO of Royal Dutch Shell. Speculation is that Reliance is using the joint ventures as a learning mechanism with the intent of bringing shale extraction techniques back to India in expectation of the Indian government leasing land prospective for shale gas in the next year. Two things came out of the recent presentation Petrohawk gave at Enercom 2010 Oil & Gas Conference: 1) the company's willingness to move away from gas production if commodity prices remain low and 2) more data on its restricted choke program. The goal of both of these discussions, in my opinion, is to boost the company's flagging stock price, which continues to sag versus the other big Haynesville players. Harris-Munden GU #11 H, NFR Energy; Carthage Field (Haynesville Shale), Harrison Co.
Kurth Investments Unit #1 H, EOG Resources; Carthage Field (Haynesville Shale), Nacogdoches Co.
Bengal #1 H, Crimson Exploration; Carthage Field (Haynesville Shale), Sabine Co.
Wood SU #1 H, Exco Operating; Carthage Field (Haynesville Shale), San Augustine Co.
Holloway SU #1 H, Exco Operating; Carthage Field (Haynesville Shale), San Augustine Co.
Stedham SU #1 H, Exco Operating; Carthage Field (Haynesville Shale), San Augustine Co.
Wiggins Unit #1 H, Noble Energy; Carthage Field (Haynesville Shale), Shelby Co. The weekly Baker Hughes rig count showed a five rig increase nationally to 1,656. This is the twelfth straight week of increased rigs since the deep water drilling moratorium. The net increase was entirely in oil rigs, with 17 new oil rigs ans 12 fewer gas rigs. By type, there were nine new horizontal rigs, eight new directional rids and 12 fewer vertical rigs. 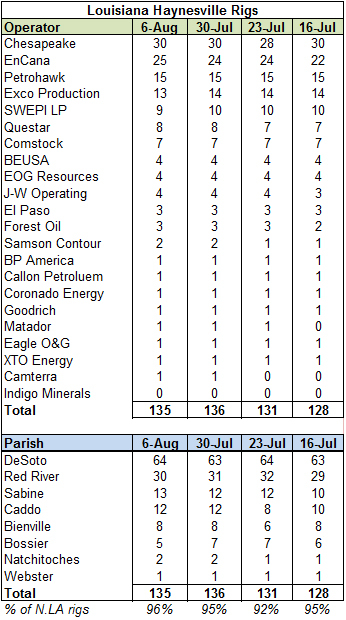 In the Haynesville Shale area, inclusive of other formations, the rig count was up by five. In north Louisiana, the count was up one to 137, while in east Texas the count was up four to 68. I was shocked moments ago when I checked my recently posted comments on natural gas prices and storage to see an advertisement on the haynesvilleplay.com site with a headline, "Our Future of Clean Coal." It is an ad placed by americaspower.org, a nice sounding lobbying group for the coal industry. The site shows sympathetic images of people who work in the coal industry with their families and in other cozy settings. One quote, "I'm essentially an environmentalist working for a coal mine." Essentially??? It reminds me of attorneys who call themselves "environmental lawyers" but who represent reprehensible polluters. I know there is a certain amount of chance when companies place ads with large aggregators, but I can't imagine a less friendly audience (or at least a less friendly author). I guess I've written negatively about coal a few times recently, including the boondoggle of FutureGen 2.0, so it might pop up as an option, but nobody is as surprised as me to see an ad touting the fantasy of "clean coal" on my site. The weekly EIA working gas in storage report showed a 40 Bcf net injection, bringing the total gas in storage to 3.052 Tcf. The weekly injection again was lower than the same week last year (+53 Bcf) and the five year average (+59 Bcf). Storage levels actually decreased by a small amount in the Producing and West Regions, while increasing by 48 Bcf in the East Region. The storage level continues to improve when compared against last year (198 Bcf, or 6.1% lower) and the five year average (177 Bcf, or 6.2% higher). Temperatures across most of the country again remained high last week when compared against normal readings, as shown below. In a recent presentation, Goodrich Petroleum said that the company has looked at restricting choke sizes on its Haynesville wells to improve ultimate recovery. While the company sees some benefits to the technique, it will not apply the technique widely across all of its completions. Specifically, the company will not restrict chokes on higher initial production wells. The company feels that the time it takes to recapture lost production from lower IP rates is close to two years and is not worth the loss in present value cash flow. Management stated plainly that it is less interested in EURs than it is in rate of return and cash flow. This is a choice each producer must make and the decision is especially important in times of low commodity prices like these. I view this as short-sighted. It benefits the company in the short run because Goodrich can maximize it production to pay its bills. But the company (and land owner) might be harmed in the long run if the ultimate productivity of the well is compromised by short-term decisions. I don't mean to slam Goodrich, but the company is heavily natural gas dependent and has to make decisions in the best interest of the company's survival. American Municipal Power, Inc. (AMP) announced earlier this week that it is moving forward with a 600 MW natural gas combined cycle power plant on the Ohio River in Megis Co., Ohio. If approved by a multitude of oversight bodies, it would be built on the site originally planned for a 1,000 MW coal-fired power plant. Apparently this new proposal is more palatable to environmental groups, one of which has already withdrawn its objections, and the members of the cooperative utility,which would save money over the long haul. While this is but one example of utility investment decisions being made all over the country, this particular decision reflects the complex environment for utilities. Not only is it a matter of how much a plant costs to build and operate, utilities must think about whether building a coal plant will expose them to future environmental restrictions that attempt to quantify the coal's environmental and human health damage. They must also look at the new paradigm of natural gas supply. Shale gas discoveries have erased the supply concerns that have long made natural gas prices so volatile. In reading through a few presentations from the EnerCom Oil & Gas conference, I noted a couple of new Middle Bossier Completions. Interestingly, neither was reported by the operator, so I can't fully vouch for them. GMX Resources reported that it considers the Hazel Byrne well a Mid-Bossier completion based on TRRC filings. The completion was previously reported on this site a few weeks ago, so I'm reclassifying it. 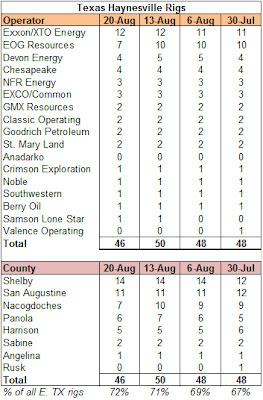 GMX is pretty excited about the prospects of this well being a Mid-Bossier because it is something of an outlier compared to existing MBS penetrations, being the only MBS well in Harrison Co., TX (see Mid-Bossier map towards the bottom of the map page). If it indeed is a Mid-Bossier completion, it implies good things for GMX's acreage at a time when low natural gas prices is causing the Harrison County area to be less attractive to investors. Carolyn Bell Deep GU #1H, NFR Energy : 8.804 MMcf/day IP, 22/64" choke; Carthage Field (Haynesville Shale), Harrison Co.
Wiener #1H, Chesapeake Operating: 11.533 MMcf/day IP, 20/64" choke; Carthage Field (Haynesville Shale), Panola Co.
Markey Gas Unit #1H, Devon Energy: 2.364 MMcf/day IP, Adj./64" choke; North Carthage Field (Bossier Shale), Panola Co.
McRae Hay GU #5H, Goodrich Petroleum: 5.208 MMcf/day IP, 18/64" choke; Carthage Field (Haynesville Shale), Rusk Co. 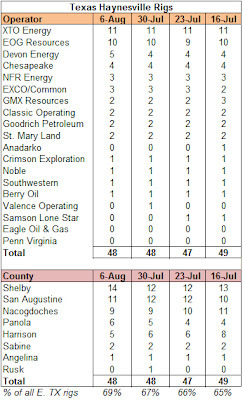 The weekly Haynesville Shale rig count decreased by three to 177. In Texas, the count dropped by four to 46, and in Louisiana, the count increased by one to 131. Tho themes run through these potential transactions. First, size. It is becoming clear that for producers to successfully maintain a shale drilling program the companies need to be of substantial size and have good access to the capital markets, both for debt and equity. The history of the domestic natural gas industry is that small scrappy companies developed finds and larger ones came in behind, either buying acreage or further validating the play. It appears that there is little room left at the shale table for the little guys (not that any of the above mentioned companies are "little guys"). The weekly Baker Hughes U.S. rig count continues to show new rigs deployed, this week increasing by 11 to 1,651. The big increase was in oil rigs (+19), while gas rigs dipped (-7) and directional rigs dropped by one. By type, horizontal rigs increased by ten and vertical rigs increased by six, while directional rigs dropped by five. In the Haynesville Shale area, inclusive of other formations, the rig count decreased by six to 200. North Louisiana held steady at 136, while east Texas dropped by six to 64. 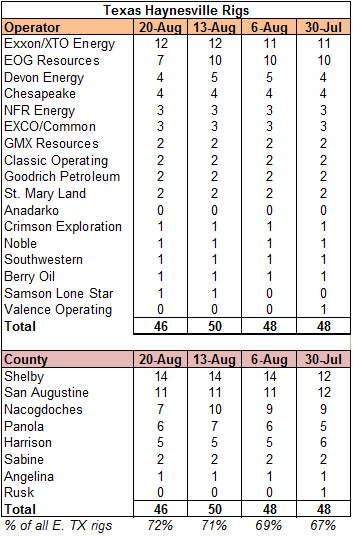 The 64 rig figure in east Texas is the lowest level of working rigs in the area since January 22, 2010. 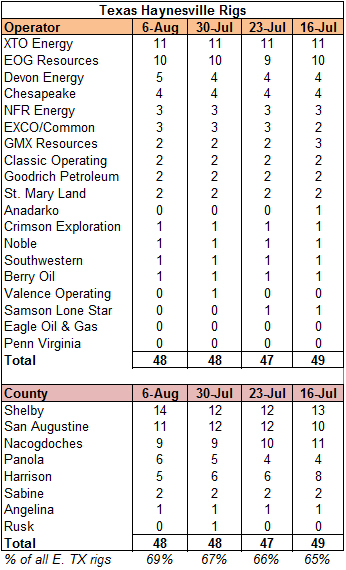 This week also marks the first time this year that the north Louisiana rig count is lower than it was six months ago. 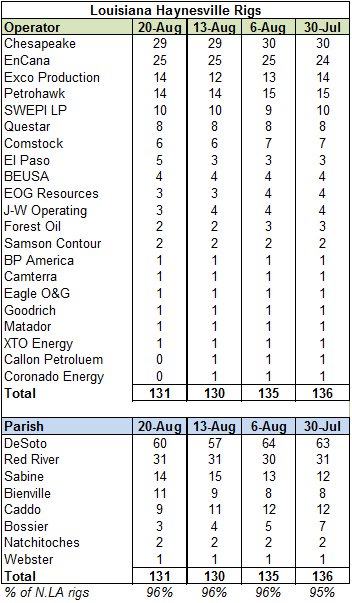 The total number of rigs working in E TX and N LA peaked on April 30 at 221. 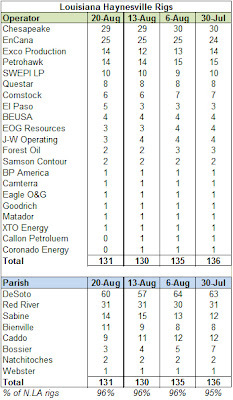 The N LA rig count is a better proxy of Haynesville activity because +/-95% of the rigs working in the area target the Haynesville Shale compared to 50-65% for E TX. Does this indicate a plateauing of the Haynesville area rig count, a temporary time out or the beginning of a longer decline? I'll have the detailed Haynesville rig count and map by late afternoon or tomorrow. A couple of interesting notes. First, the current storage level in the East Region, the biggest of the three regions, is now only 1.0% higher than the five year average. Second, the Producing Region, the second largest region, showed a 16 Bcf net withdrawal, which is not unheard of but is not altogether common this time of year. As the graphic below shows, the warm weather certainly contributed to the low net injection. Today, Crimson Exploration announced the completion of its Grizzly #1 Middle Bossier Shale well in San Augustine Co. TX in the company's Bruin prospect. The well, which is still undergoing some cleanup, IP'd at 11.5 MMcf/day on a 16/64" choke at 9,100 psi. Given the restricted choke, Crimson is very pleased with the well's result, stating that the well "has validated the reserve potential of the Mid Bossier Shale in its Bruin Prospect Area." Crimson also touted the fact that the well was completed using a restricted choke technique, a practice that the company described as "industry-best practices for reservoir optimization to maximize ultimate recovery." Crimson is on board with the restricted choke technique based on the results of other operators. Production charts from the first two weeks of the Grizzly well ("Graph 1" below), indicate a higher pressures and steadier flow rates. But of course, two weeks of data does not validate the process. Still, it is encouraging. "Clean coal" is back again. This time in the form of the Department of Energy's approval of $1 billion for a "clean coal" power plant in Mattoon, IL under the guise of FutureGen 2.0. The grant is part of $3.4 billion of stimulus money targeted at "clean coal." Given the tenacity of the coal lobby, all of that stimulus money might actually get spent. The plant is touted as "the world's first, commercial-scale, oxy-combustion power plant" and carbon dioxide storage network. The phrase "commercial-scale" is key since it is an unproven technology at any large scale. The project will repower a 200 megawatt coal plant in Meredosia, IL owned by Ameren Energy Resources. It will be the successor to the FutureGen project that was approved by President George W. Bush in 2003 that was later canceled in 2008 for cost overruns and a lack of tangible progress. Many folks will call it pork barrel politics. There is probably some truth to that - it is politics after all - but I think that criticism misses the target. The bigger issue is pouring a billion dollars down the rabbit hole that is "clean coal." In an interesting transaction, private equity company Blackstone acquired Houston-based power generator Dynegy in a deal worth about $4.7 billion. In truth, Blackstone acquired Dynegy for nothing and will get a bank account seeded with an additional $800 million for its trouble. Here's how: Blackstone agreed to pay $543 million for the stock of Dynegy while simultaneously selling four of the company's natural gas power plants to NRG Energy for $1.36 billion. Blackstone assumed Dynegy's $4+ billion of debt, but that's not an upfront expense since there were no change of control provisions. 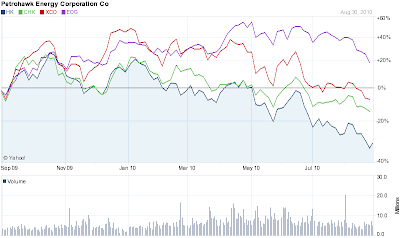 I wonder how soon after closing we will hear about a big dividend paid to Dynegy's new shareholders. It's a really interesting deal for a lot of reasons. 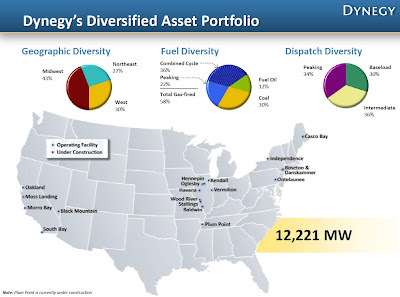 Dynegy, which started life in 1984 as a natural gas trading company called the Natural Gas Clearinghouse and then got into pipelines, trading and power generation, will become a company increasingly dependent on coal. The company will be selling natural gas facilities in Casco Bay, ME; Moss Landing, CA; Morro Bay, CA; and Oakland, CA, thus increasing its exposure to coal from 26% to 37% (see map below). The new Dynegy will be much less focused on natural gas and will have a footprint dominated by the upper Midwest. Youngblood #1H, Chesapeake Operating: 5.24 MMcf/day IP, 22/64" choke; Carthage Field (Haynesville Shale), Harrison Co.
Jenk-Hazb GU #1H, Berry Oil: 9.723 MMcf/day IP, 18/64" choke; Carthage Field (Haynesville Shale), Harrison Co.
Werner #1H, Chesapeake Operating: 11.151 MMcf/day IP, 20/64" choke; Carthage Field (Haynesville Shale), Panola Co.
Watson GU #5H, BP America: 5.585 MMcf/day IP, adjustable choke; Carthage Field (Haynesville Shale), Rusk Co.
Smith #1H, Chesapeake Operating: 3.615 MMcf/day IP, 14/64" choke; Carthage Field (Haynesville Shale), Shelby Co.
SWEPCO Deep GU #1 H, NFR Energy; Carthage Field (Haynesville Shale), Harrison Co.
Hill Gas Unit #7 H, EOG Resources; Carthage Field (Haynesville Shale), Nacogdoches Co.
McKinney Gas Unit #1 H, EOG Resources; Carthage Field (Haynesville Shale), San Augustine Co.
Crest D GU #1, Southwestern Energy; Carthage Field (Haynesville Shale), Shelby Co.
Crest F GU #1, Southwestern Energy; Carthage Field (Haynesville Shale), Shelby Co.
KC GU #1 H, Chesapeake Operating; Carthage Field (Haynesville Shale), Shelby Co.
Labels: Berry Petroleum, BP, Chesapeake Energy, Completions, EOG Resources, Goodrich Petroleum, NFR Energy, Penn Virginia Corp., Southwestern Energy Co. 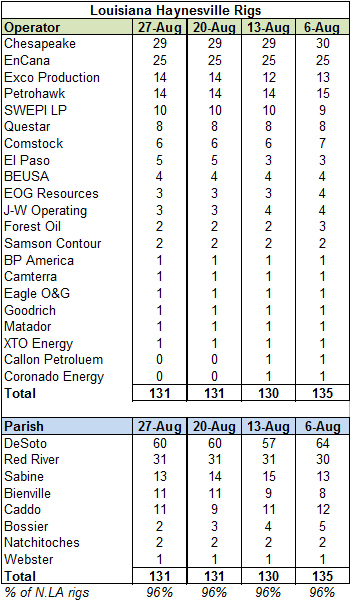 The weekly Haynesville Shale rig count showed a three rig decrease to 180. Texas saw two new working rigs, while Louisiana saw a decrease of five. The spreadsheets and maps have been uploaded and are available under the appropriate tabs. The weekly Baker Hughes rig count showed a 35 rig increase this week in the U.S., bringing the total number of working rigs to 1,640. The big increase was in oil rigs, which jumped 25 to 636. Gas rigs increased as well, up nine to 992. Directional rigs were up one to 12. By type, vertical rigs were up 27, horizontal rigs were up seven and directional rigs were up one. 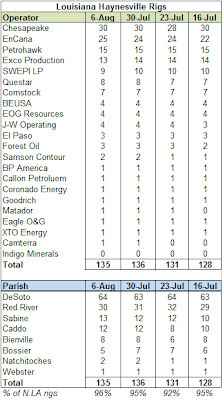 In the Haynesville region, inclusive of other formations, the rig count dropped by five to 206, with the entire decrease coming in north Louisiana. 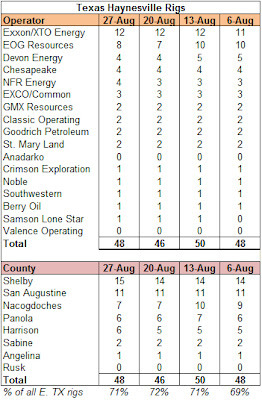 A detailed Haynesville Shale rig count will be published late today or tomorrow. The monthly lease auction by the Louisiana Mineral Board had a number of north Louisiana parcels prospective for the Haynesville Shale. 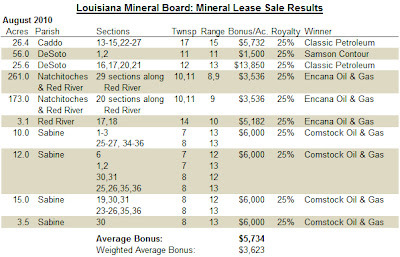 Because the sale featured many parcels that were outside the established hot drilling areas, often on land where there are no Haynesville units, the bonuses weren't terribly large. The average lease bonus for the auction of these properties was $5,734, but the weighted average (based on acreage) was $3,623, as shown on the table below. Yet again the weekly EIA working gas in storage report showed a smaller build in natural gas storage than recent historical indicators. This week, the net injection was 37 Bcf, bringing the total to 2.985 Tcf. The net injection for this week was well below last year's (+63 Bcf) and just slightly below the five year average (+39 Bcf). The current storage levels are now 5% below last year's record pace and 7.9% above the five year average. Famed energy investment banker Matthew Simmons, founder of Simmons & Co. International, died unexpectedly Monday in Maine at the age of 67. Mr. Simmons forever will be associated with the peak oil movement, especially because of his book Twilight in the Desert: The Coming Saudi Oil Shock and the World Economy . I did not know the man, but I worked with his company on several occasions. In fact, as I type I am looking past my monitor at an acrylic "tombstone" from a recent Simmons & Co. deal. I have great respect for his important legacy. His death is untimely for many reasons, not the least of which are his recent controversial comments on the BP oil spill, which he contended was significantly bigger that anyone believed, and his disparaging remarks about shale gas, which he more or less dismissed. Both of these positions attracted a fair amount of criticism. Mr. Simmons was a man who was fearless in expressing his opinions, and I am sorry that he did not have the opportunity to continue to pursue his lines of reasoning on each of these positions. I hope he is remembered for his larger body of work rather than his recent controversial remarks. Last week, Penn Virginia Corp. released its earnings and operational report. The company discussed its five recent Haynesville wells, four of which already have been noted on this site. The fifth well is the J&R Tiller #1H, status #689897, which flowed at a self-reported IP rate of 10.0 MMcf/day. One of the company's completions, Fults #2H (#685603), which IP'd at 15.3 MMcf/day (reported to the TRRC at 14.85 MMcf/day) and had a 30 day flow rate of 11.2 MMcf/day, was completed with 24 frac stages (!). Another well, the Brown #6H (#660706) was completed with 15 frac stages. The well IP'd at 10.4 MMcf/day and saw an average flow rate of 7.4 MMcf/day for the first 30 days. These were the first two wells PVA completed with more than ten frac stages. After two months, both wells had exceeded production of PVA's previous wells by about 75%. The above sounds like good news for PVA, but I guess it's not good enough in this current price environment. The company announced that it has decided to "defer drilling in the Haynesville Shale for the remainder of the year to evaluate the longer-term production results and economics of these recent wells." PVA will redirect the two wells it is running in east Texas to drill horizontal Cotton Valley wells. Two recent CV wells IP'd at 4.9 and 3.0 MMcf/day, and the play offers natural gas liquids and oil content on top of regular old gas. Replaced Forest Oil's Black Stone Minerals 26 H #1 for #2 in Sabine Parish, LA. A reader pointed out that the original entry was an expired permit. Timmins Gas Unit #3 HR, Penn Virgina Corp.: 8.975 MMcf/day IP, 28/64" choke; North Carthage Field (Bossier Shale), Harrison Co.
Fults Gas Unit #2 H, Penn Virgina Corp.: 14.85 MMcf/day IP, 28/64" choke; Carthage Field (Haynesville Shale), Harrison Co.
Baldwin #14 H, GMX Resources: 7.552 MMcf/day IP, 28/64" choke; North Carthage Field (Bossier Shale), Harrison Co.
Verhalen E #1 H, GMX Resources: 6.429 MMcf/day IP, 16/64" choke; North Carthage Field (Bossier Shale), Harrison Co.
Bell #5 H, GMX Resources: 6.459 MMcf/day IP, 13/64" choke; North Carthage Field (Bossier Shale), Harrison Co. 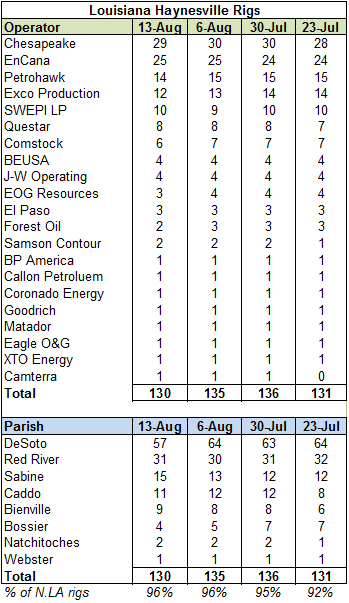 The Haynesville Shale rig count dropped by one this week to 183, with one rig falling off in Louisiana this week. The weekly Baker Hughes rig count showed a robust 19 rig increase to 1,605 nationwide. Gas rigs increased by 11 to 983, while oil rigs increased eight to 611. The biggest increase was in horizontal rigs with 25 new rigs working. Vertical rigs dropped by seven and directional rigs increased by one. In the Haynesville region, inclusive of other formations, the rig count dropped by four to 211, decreasing by two in both north Louisiana and east Texas. Busy afternoon. Detailed Haynesville count will be delayed somewhat. I have long been struck by the loss of Louisiana's precious wetlands. It is a story that is getting a great deal of attention in the national press with the BP oil spill disaster, but the seeds for the real disaster were sewn several generations ago. This week, New Orleans Times Picayune outdoors writer Bob Marshall penned a four-part series on the decline of Delacroix Island, which lies southeast of New Orleans in St. Bernard Parish. Once a self-sufficient and thriving town that lived off the bounty of the land, Delacroix is now a withering strip of land staring down its own demise. While south Louisiana is a little off topic for a Haynesville-centric web site, the lesson is important and it applies to the whole domestic natural gas industry and all of its stakeholders. Louisiana wetlands were irreparably damaged by oil and gas development. There were other contributing causes, such as building levees and dams along the length of the Mississippi River, but nothing else hastened the damage to the wetlands like oil and gas drilling. We as a state put short-term gain ahead of long-term impacts. We have never held the energy companies accountable for the environmental damage and still don't in any meaningful way to this day. The weekly EIA storage report showed a second straight week of a 29 Bcf net injection into storage, bringing the total to 2.948 Tcf. This net injection is considerably lower than last year's (+67 Bcf) and the five year average (+47). The current storage levels are now 4.3% (-132 Bcf) below last year's (record high) levels and 8.1% (+221 Bcf) above the five year average. The disparity between current levels and the five year average continues to narrow. It's nice to see the red line come off the ceiling in the chart below. Exco Resources reported its second quarter earnings earlier this week and gave an update on its Haynesville and Middle-Bossier Shale operations. Exco is currently producing in excess of 500 MMcf/day from its Haynesville acreage, which represents 80% of the company's current production. Obviously, the Haynesville/Mid-Bossier Shale is an all-consuming project for the company. The company leases 182,000 net acres in the region, 80,000 net acres of which are prospective for the Haynesville Shale (the company is in a 50-50 joint venture with BG Group, which also has 80,000 net acres). Exco went out of its way in its discussion of results to note that because of depressed commodity prices it would be focusing on its higher returning locations in DeSoto Parish (Holly Field) and the Shelby Trough region of Texas. It will also target areas where the company is subject to lease expiration. As a result, Exco will defer drilling in northern Caddo Parish, LA and Harrison Co., TX for now. Exco says that half of its acreage is held by production. 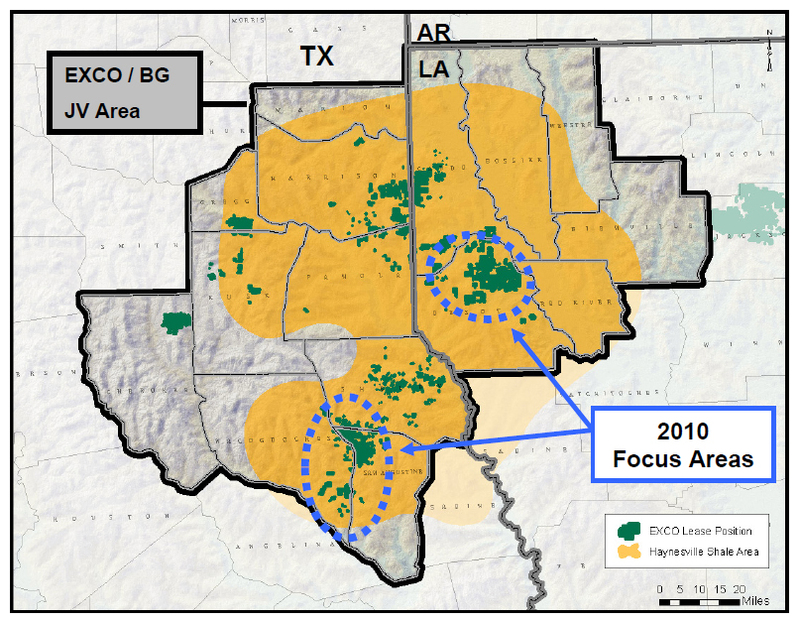 I'm not sure where the non-HBP acreage is located outside of the focus areas, so it will be interesting to if the company does much drilling outside of the blue circles below. Petrohawk Energy's second quarter earnings and operations report was relatively uneventful as it concerned the Haynesville Shale. The company's discussion mainly centered on operational improvements to save the company money and improve ultimate gas recoveries. First, as noted in a previous post, the company will try a modified wellbore design to do the fracture stimulation pumping at 10,000 psi versus the typical 15,000 psi. This is important because there are only a few pressure pumpers that provide services at the higher pressures. They are in high demand and charge accordingly. The 10,000 psi level is more typical for the region and there are many more contractors that can provide this service. The end result if this test is successful should be a fairly significant decrease in completion costs (Petrohawk estimates this to be $1 million per completion). The company announced that by year end 2015 it expects 25% of the company's production to be in liquids. To achieve this shift, Chesapeake is going to allocate an increasing amount of capital expenditures to liquids rich plays. In 2009, the company spent 90% of its capex funds in natural gas plays, versus 10% for liquids plays. The company's projected 2012 capital budget will shift that ratio to 45% gas/55% liquids. Chesapeake stated that its total capital budget for 2011 will not change much from 2010, except the gas play budget will shrink by $400 million and the liquid plays budget will increase by that same amount. 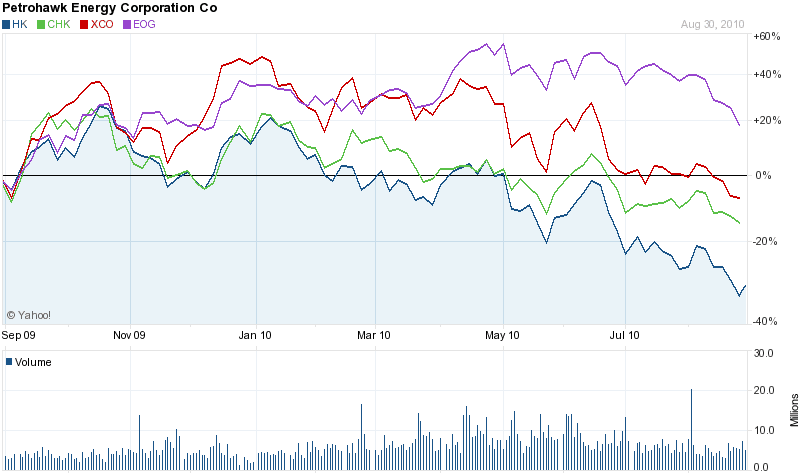 Quite a change America's Champion of Natural Gas. The city of Lafayette, Louisiana has followed Shreveport/Bossier City by deciding to implement a fleet of compressed natural gas (CNG) municipal vehicles. What swayed Lafayette? Improved air quality, lower fuel costs, the potential for governmental funding and the abundance of gas from the Haynesville Shale. The article linked above has a pretty good update of the status of the CNG movement in Louisiana. One item of note is a step by Apache Corporation to help address the chicken and egg problem of building CNG stations when there are few CNG customers. The company will take the plunge and install a CNG fueling station in Lafayette by early 2011. It's the first step in a long process. I will update the Louisiana spreadsheet and maps on Thursday after the DNR weekly release. Jobe Shale Unit #1H, Exco Operating: 8.952 MMcf/day IP, 18/64" choke; Carthage Field (Haynesville Shale), Harrison Co.
Lamkin #1H, Noble Energy: 7.036 MMcf/day IP, 22/64" choke; Carthage Field (Haynesville Shale), Shelby Co.
Mia Austin #3H, GMX Resources; Carthage Field (Haynesville Shale), Harrison Co.
Penny Lane GU 1 #1H, Samson Lone Star; Carthage Field (Haynesville Shale), Nacogdoches Co.